I hate Majorette's! Hate, hate, hate! From the age of two all the way up until I was twenty I went to dance school and one discipline was Majorettes. Granted I didn't actually start majorettes until I was five it was still the most dreaded class of my day. I can not tell you how any times I have burst my nose, nearly knocked myself out or lost a tooth through twirling a baton. Ah those were the days. However I can cast aside my lack of love for such dance style when it comes to the super beautiful blush booster that is Benefit Majorette Blush. 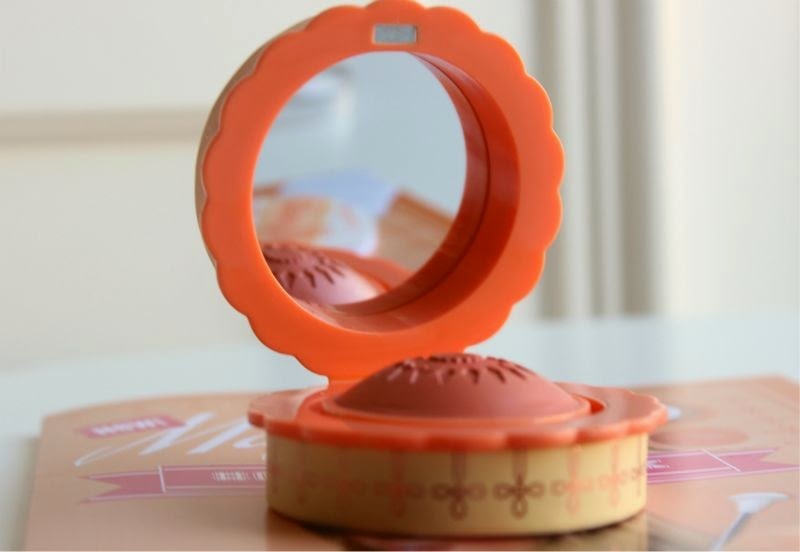 Now just look at that super cute packaging, a round almost tambourine shaped blush compact that features a scalloped edge. 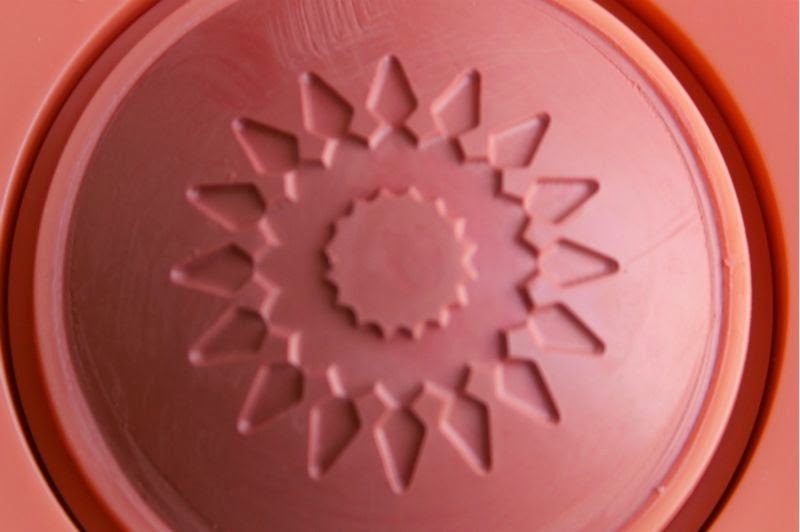 Unlike the vast majority of Benefit blushes this is made from plastic rather than cardboard. Inside you will find a dome shaped blush that has its own shield/cover to protect it from damage and a great sized mirror for on the go application. I like that the little dancer motif on the outer casing is almost identical to the B.A.T.D (British Association of Teachers of Dancing ) Majorette symbol...ah memories.The general idea is that you apply this using your finger tips hence the lack of brush. As you can most likely see from my photos Benefit Majorette Booster Blush is a light golden peach blush, it reminds me slightly of a more pigmented version of the now discontinued Benefit Georgia Blush. 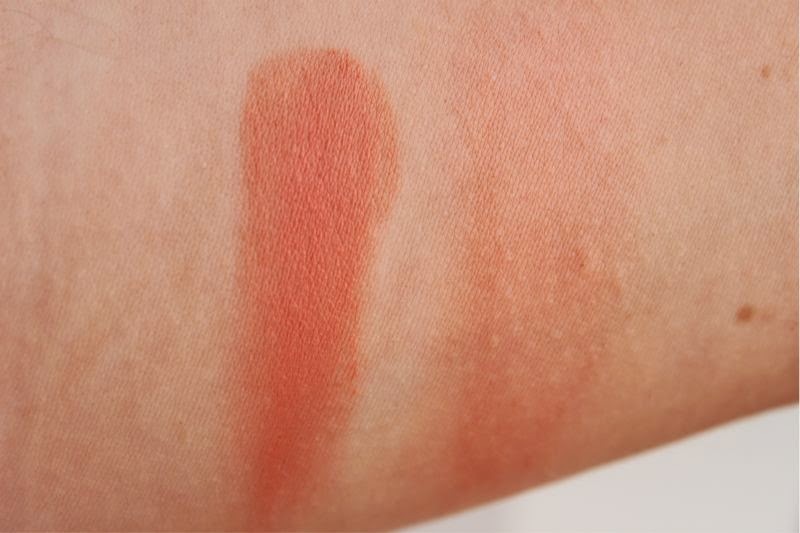 Although it looks pretty bright in the pan, once applied Benefit Majorette Booster Blush is a light, easy to wear coral come peach hue that not only brightens the skin but adds a pretty glow too as well as a flush of light colour. 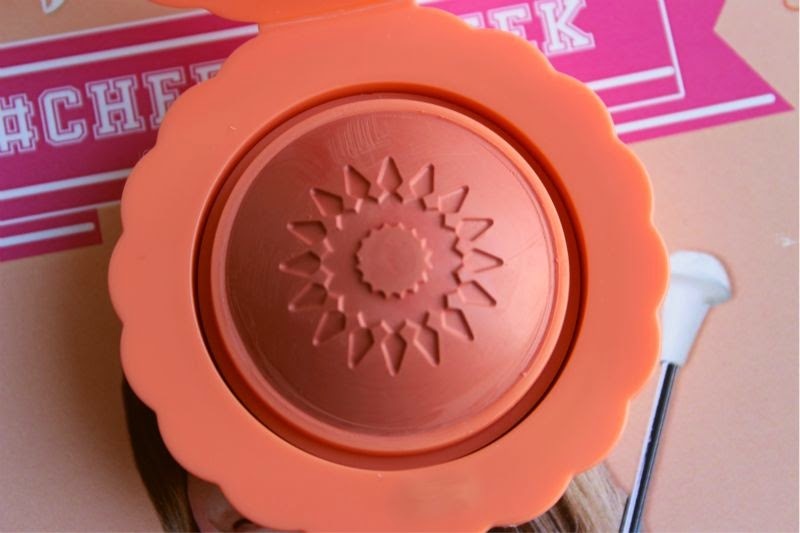 If you like coral or peach blushes there is no doubt in my mind that you will love this. Benefit Majorette Booster Blush has been created not only to be worn as a stand alone product but to go underneath your favourite blush to "boost" the colour and overall effect. In all honesty I am not a huge fan of layering cream and powder products but there is no denying that it will amplify any shade layered on top. 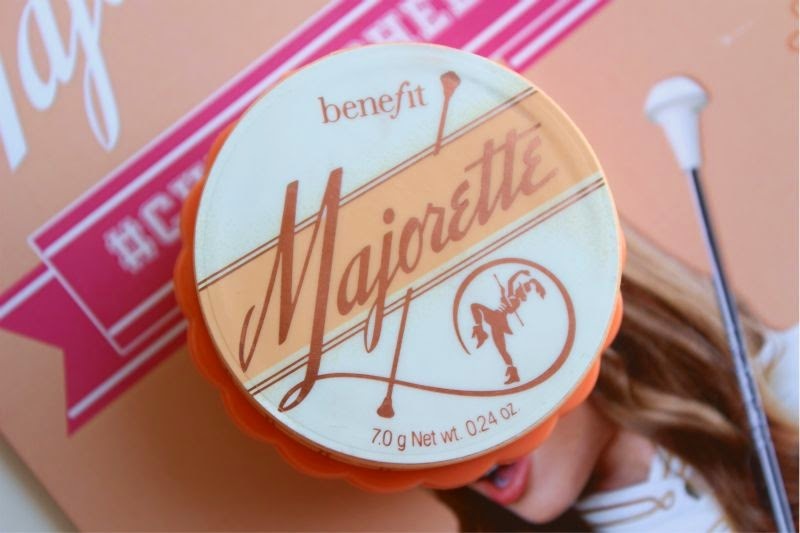 To look at the Benefit Majorette Booster Blush you would assume that it is a firm and perhaps thickly textured cream blush? Well I am happy to report that is not the case at all. Benefit Majorette Booster Blush somewhat melts with the natural heat of your fingertips to create a light, gel like textured cream blush. Such texture glides on to the skin with ease and can does not create any harsh edges. 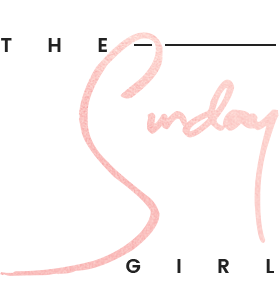 It really is extremely difficult to go wrong with this blush in terms of application - you truly would be hard pushed to over apply. As someone with enlarged pores I am happy to report that this does not settle into such fault but rather helps to create an overall soft look. I did mention above that this can be used underneath a powder blush to amplify the pigment which it does but do be aware it can cake and look a little heavy. Personally I like to wear Benefit Majorette on its own as a light peachy everyday blush. This is a cream to powder finish which works exceptionally well on my oily skin (around 8 hours of wear before fading), the gel like initially texture leads me to believe that this won't cling to dry skin types but I can not say that with 100% certainty. 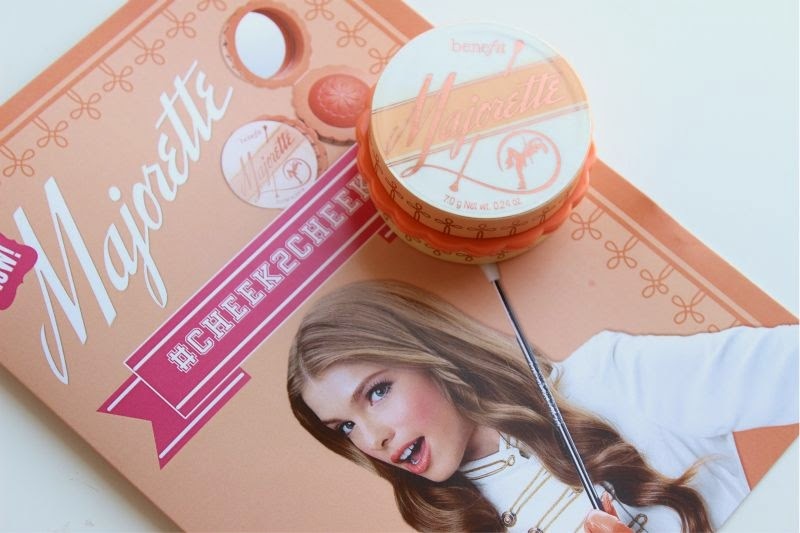 I may never pick up a baton again but Benefit Majorette Booster Blush has my seal of approval. 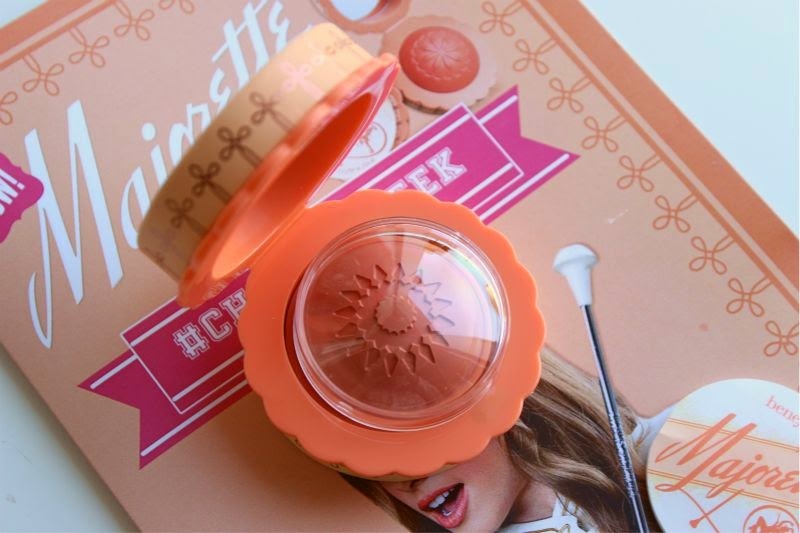 Benefit Majorette Booster Blush £23.50/7g via Debenhams - link. WOW...this has got to be one of the most detailed packaging ever. That is a lot of work. The color looks great against your skin, I think it would work out well for darker skin tones too. 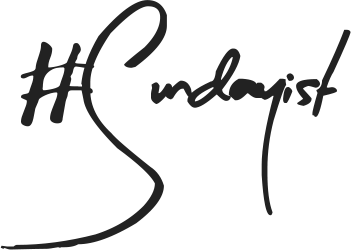 Thanks again for another great post. I can't get over how pretty that is! Lol. I tried this the other day and its amazing! It looks like a lovely product! I would buy this JUST for the packaging. So cute! The shade of this looks lovely! such a beautiful shade! you're right about the packaging, it's so cute! this is such a pretty product, and I adore the packaging!! Love the packaging and love the colour too! It's a very intriguing colour for a blush, and I like that you said it lasts a while on oily skin as I'm always looking for a blush that can withstand my pores! Also, thanks for explaining what a Majorette is, I didn't have a clue! The shade looks so pretty, and I love the packaging! Adorable as always. This looks so pretty and the packaging is gorgeous as usual! I'm convinced i need this in my life. Do you think it's about the same size as bourjois' round blush? It looks tiny! This is one of the most beautiful packaged products I have ever seen! The shade looks so amazing too. This packaging is just too cute! I'm such a sucker for stuff like this....oops! Such cute packaging. Color is fab too. I am so lemming this, not only because it looks such a lovely wearable everyday shade, but also because the packaging is so pretty! Ugh, I actually hate the packaging. Too high-school for me and I was never a fan of this kind of themes in makeup. Although blush inside looks lovely! forget anything else, the packaging is stunning! Really different packaging from the other Benefit products but the blush it self looks crazy pigmented. I bought this from QVC, but sent it back. I hated it. It's too peachy (no one comes in from the cold with orange cheeks, lol! ), poor pigmentation and no staying power. And a ridiculously bulky casing. Love benefit. Didn't love Majorettes, sadly. This is the first time I have heard of this product. I am curious to give it a try. The packaging is very cute! 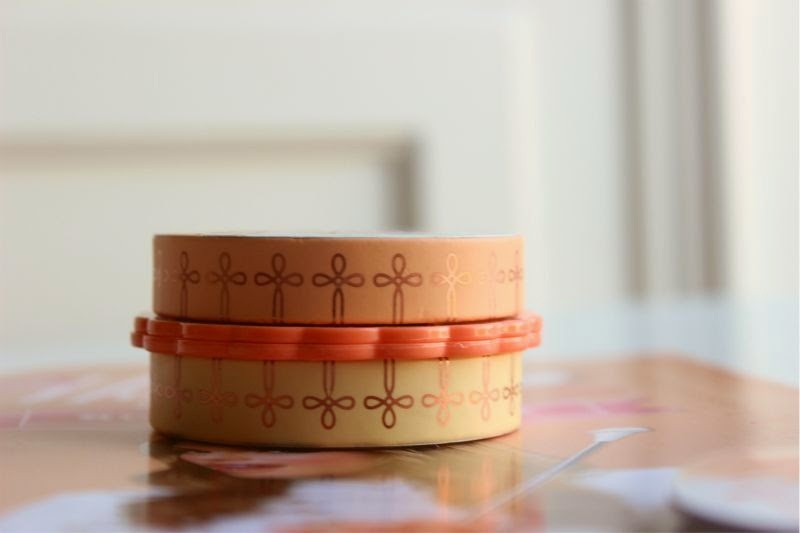 Adore the packaging, and it would look lovely under a dusty shade for autumn! 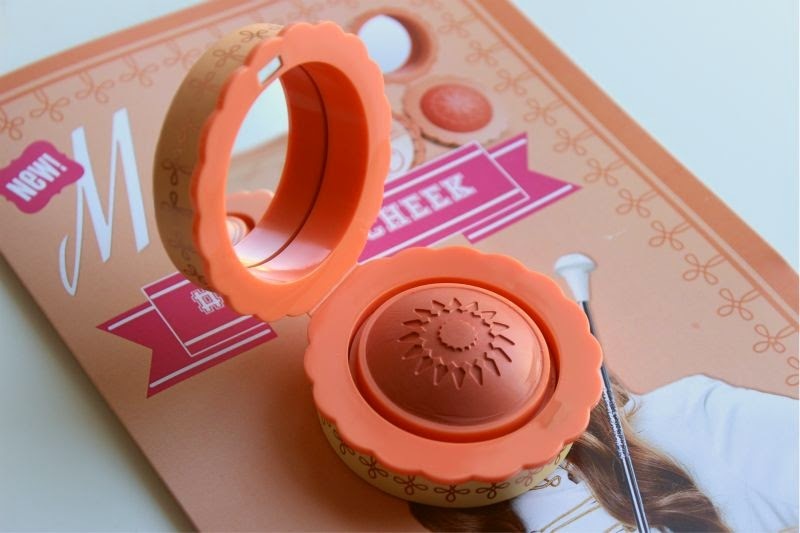 I am in LOVE with this blusher, I need one in my life! I'm definitely adding Majorette to my wish list!